Happy Holidays: I have been busy in the studio. I had promised to show you what has been going on in the studio, so here we go. Quite a few of these items I have picked up at General Salvage, one of my all-time favourite stores in town. I will do a post about it in the near future with lots of pictures so that you can see why I like it so much. 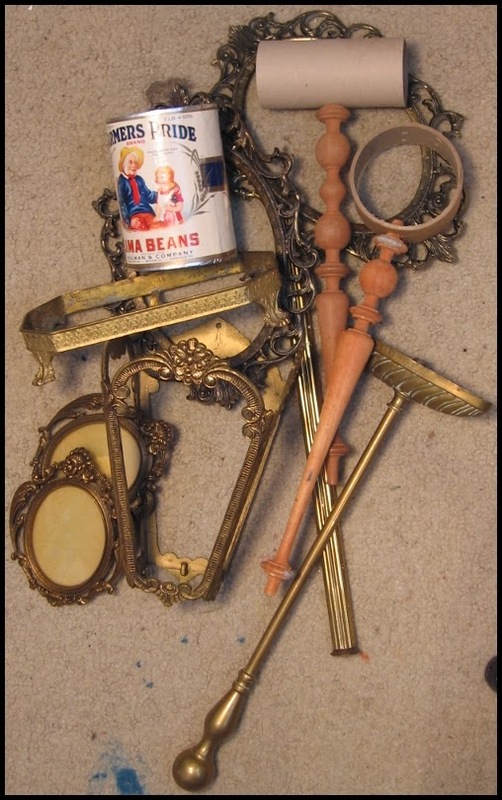 The brass picture frames I picked up at Salvation Army. This lot will be turned into parade lanterns, rattles and sculptures. What looks like a tin can is a piece in progress, Debra Schoch of "HopHopJingleBoo" included this label as well as a bunch of other delights in a contest give-away that I won last year - Thank-you again Debra. It is wrapped around a cardboard cylinder and by the time it is finished will look like a real tin of lima beans. Here are those treat buckets that I was working on. Twelve new heads, some are pumpkinish but most of them are based on squash and gourds. The moulds are ready to be taken off of the clay heads and then I can cast, paint and assemble all kinds of delights. 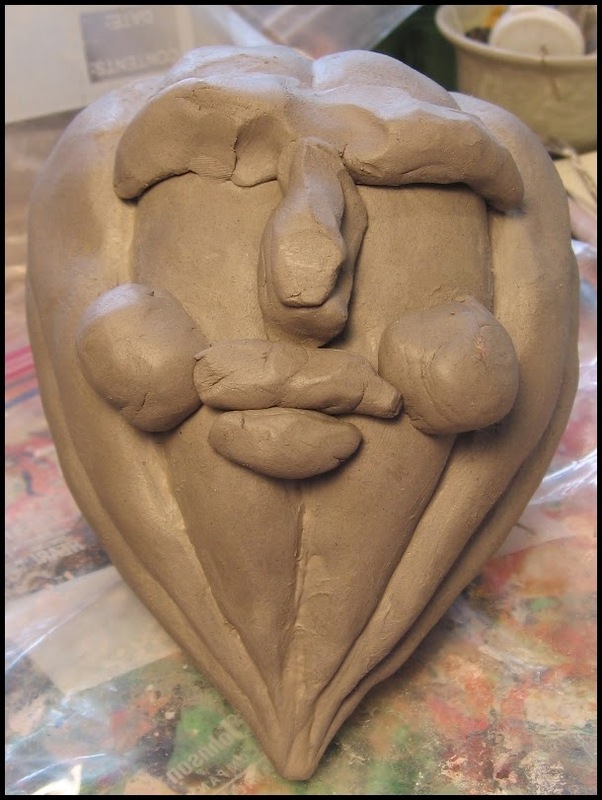 I thought that I would show you how I approach the sculpting of the heads whether they are large or small. First and foremost they are vegetables that just happen to be alive, so I always sculpt a realistic vegetable first. I have various books that I use for reference, so with a quick look or a bit of a study I sculpt the veggy form. Once the vegetable has been sculpted I turn it around to find the side that the face looks the best on. 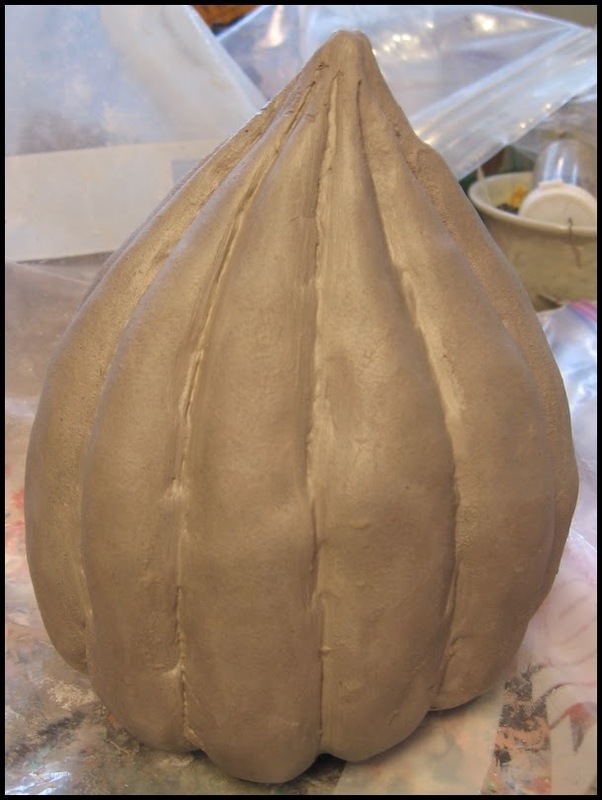 Large lumps of clay are placed on the veggie for the features. 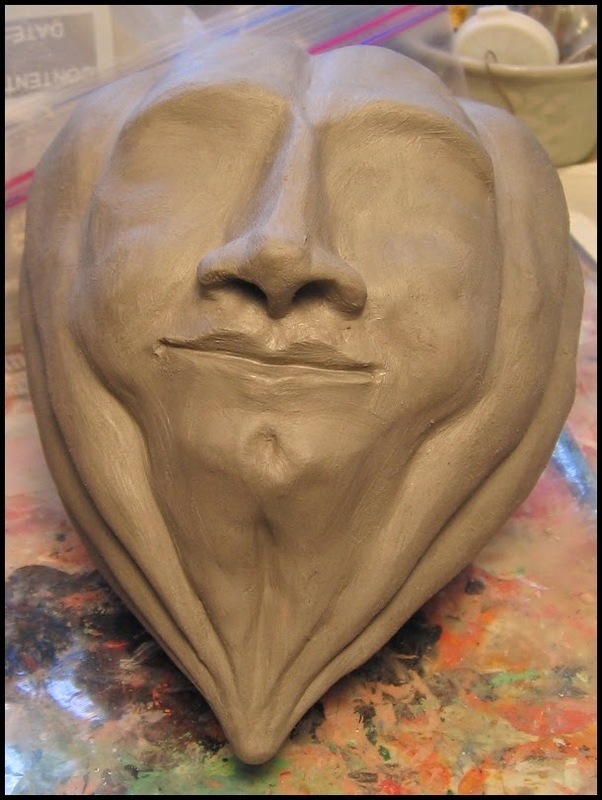 They are then smoothed out, refined, all the while adding more clay as needed to build the face to its completion. This is what I finally ended up with for this squash. I have other large heads that are ready to be turned into moulds but you will have to wait and see what I come up with for the finished pieces. This year I will only be focusing on Hallowe'en sculptures. I am fairly busy doing window displays for the shopping centre. Sometimes I have a nice large block of time to work in the studio then all of a sudden I have a display job that cuts into studio time, this happens with freelance work and it is not a complaint. I need a lot of finished pieces for September. It will be easier to focus on one holiday and have the work ready in time without losing my mind. Why do I have to have so much work ready for September, you may ask. I will be seeing a lot of my on-line friends in Petaluma, California at Hallowe'en and Vine. I have been accepted, WHOOPEE!!! Well, I had better get back to work. Wooohooo and hurray!!! Congratulations Len! That is awesome! 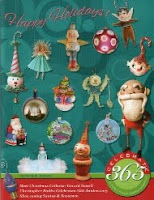 I think you will be a huge hit at Halloween and Vine! Your pieces are MAGICAL!!! Very kind words indeed, thank-you very much. Love the new pieces Len! Congras on getting into H&V! Thanks, I am really looking forward to meeting everyone in person. How do you do the molds (unless they're all one-offs)? Awesome post. Love the transformation from the basic figure to the more refined version. Thanks, Lenny. I use latex for the moulds. Once I put on the required amount of layers, 5 - 6 for the small pieces and more for the larger pieces, I let it cure and then cut the mould of with a utility knife. It can be reused over and over. I do custom carve some of the casts so that it has a slightly different look. The real change comes from the painting of the cast. I use anywhere from 6 to as many as 12 layers of paint. each layer may be a glaze or a solid coat that I then pat off with my hands. The finished paint surface has many subtle colourations to the surface. Aieeeee! That's alot of paint. Crikey! More to the point, that's alot of time. The only problem I have with moulds is that I use this RTV silicone and it's really expensive. It doesn't take that much time to paint them. I slap the paint on if it is a glaze sometimes patting bits of it off and let it dry. If it is an opaque paint I slap that on and then pat it with my hands to take off excess paint and then let that dry. The drying part takes the longest. The painting of the features also takes a little longer and there is the waiting as well between layers for it to dry. The depth to the finished surface is quite beautiful. One piece looked like leather or the deep rich patina of a gourd. You cannot fake these surfaces. The depth is what I am looking for, the piece is so much more interesting to look at. I use liquid latex, it is not nearly as expensive. I was thinking of using silicone but never looked into it. I figured it would be a little on the pricey side. Not sure how I missed this post Len, but I enjoyed the read and I see you came out about H&V... haha! Hearty congrats my friend! !